May 22, 2003 - One of the most savage heroes who ever carved a bloody swath through the pages of pulp fiction is about to be reborn in a series of finely crafted limited-edition busts. 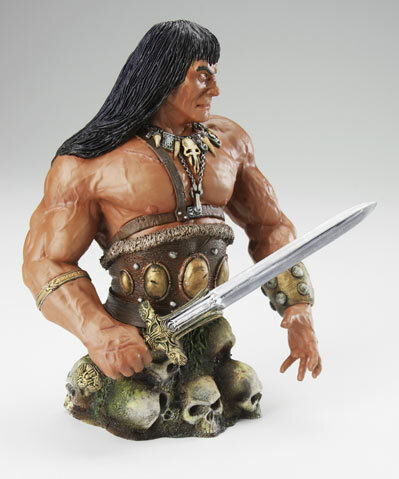 Titled Conan the Slayer, the initial release is a depiction of author Robert E. Howard's untamed Cimmerian warrior at the peak of his maturity in his life's journey from boy-thief and mercenary to a king's high throne. Additional pieces will follow presenting Conan at other stages of his life. The sculpture was created by artisan Jeffery Scott, who has won acclaim for his work with Gentle Giant Studios of Burbank, California. "Jeffery really understood the essence of Conan", Dark Horse Comics' product development head David Scroggy remarked, "and was able to convey the almost feral sensibility that marks this character as a protagonist like no other. He is as the face of death - coiled like a wildcat and ready to spring!" 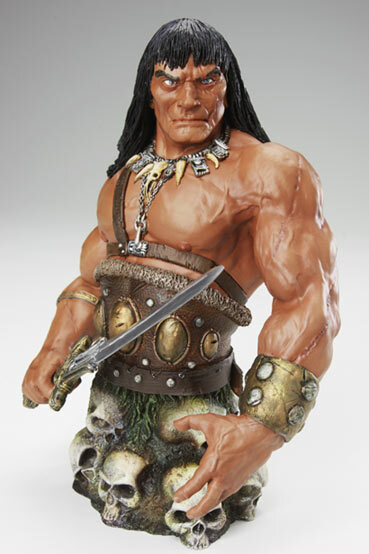 The piece, which is hand-painted, details many fine points of Conan's costume, weapons, jewelry and complexion. At this point in his life, Conan is a veteran of many battles large and small, with the scars to prove it. "We wanted to achieve realism in his skin tones and the way his scarring was handled", Scroggy continued, "and the paint masters at Gentle Giant were up to the task. We also paid a lot of attention to various textures such as the leather straps, bone necklace, distressed metal wrist bracelet, and of course his sword. The result was a piece we are very proud of." Author Robert E. Howard was born and raised in rural Texas. He began writing at an early age, and was a prolific contributor to the pulp magazines of his day. While he created many characters, he is most famous for Conan, who appeared in the pages of Weird Tales magazine in the early 1930's. He tragically ended his own life at age 36 in 1936. A film based on Howard's life, The Whole Wide World, starring Vincent D'Onofrio and Renee Zellweger, was released in 1996. The figure measures just over eight inches from top to bottom. His sword is nearly seven inches from hilt to point. The bust will be packaged in a full-color collector's box, and will be hand-numbered on the underside of the base. The edition size had not been determined as of press time. Suggested retail price is $49.99. Release is scheduled for September, 2003.